An emerald ash borer specimen is displayed during a meeting in Frenchville in June to show area residents what to look for in their ash trees. State officials with the Maine Department of Agriculture, Conservation and Forestry announced Wednesday that entomologists have confirmed the presence of emerald ash borer in western York County. This new development follows a spring discovery in northern Aroostook County. Officials say the emerald ash borer is a highly destructive, introduced pest of forest and ornamental ash trees. Since its initial detection in southeastern Michigan near Detroit in the summer of 2002 it has spread rapidly. As of August 2018, it has been found in 35 states, and four Canadian provinces including Maine. Earlier this week, emerald ash borer adults were recovered on two purple traps in York County. Adult beetles were found in each Acton and Lebanon. Field personnel from the Department of Agriculture, Conservation and Forestry, Maine Forest Service say they are currently conducting ground surveys in the area to follow up on the trap detections. Ash trees infested with emerald ash borers may die within two to three years. 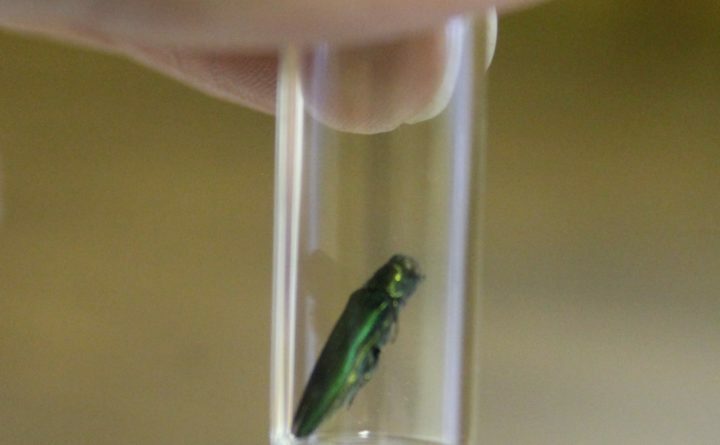 Since its arrival in North America, officials say emerald ash borer has killed hundreds of millions of ash trees in infested states and provinces, and has cost municipalities, property owners, nursery operators and forest products industries hundreds of millions of dollars. Officials say ash trees comprise four percent of Maine’s hardwood forest, are a valuable timber species, and are also an important street tree. Officials say emerald ash borer threatens all species of ash trees and will have significant ecological and economic impacts on the state.